Picture the scene. You open your Sunday newspaper to discover that a cabal of Westminster MP’s have decided that from now on the UK will be run on a Presidential system, that an interim President chosen from the “political elites” would be installed any day now but we might be able to vote on a President in 2017. After choking on your Cornflakes and passing on to the sports section you could reflect that this is not dissimilar to what has happened to the 2.7 million inhabitants of Greater Manchester. The situation becomes even more democratically surreal when you consider that Mancunians were polled about having a Mayor in 2012 and said ta very much but you’re all right. The background to this rather bizarre situation is as follows. 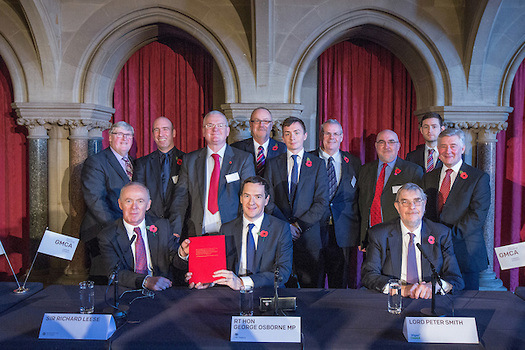 In a moment of back of a fag packet policy panic George Osbourne blew into Manchester all full of jobs, growth and “Northern Powerhouse” soon after the Scottish independence vote in November of last year and he herded together a group of local Labour Party council bigwigs to sign off on a package conjured up by their right wing think tank, ResPublica, as “Devo Manc”. We were told that Greater Manchester was to become some form of post renaissance neo City state rather like Venice with less canals but with a Doge installed. This was presented as such a done deal that George pre-empted calls for a referendum on the matter by saying that there would be no referendum on the matter. One could also consider this deal as more than done as the powers that be are obviously fully aware that we have a general election just around the corner and yet they’re not even prepared to allow the matter space on a ballot paper that will already be being printed. So why the fait a compli and perhaps more importantly why is this being done with zero public consultation or indeed any referral to the people whatsoever? The simple answer is that following the Scottish referendum “NOT YET” vote the political establishment fully understand that the break up of the Union is an inescapable inevitability and they want the break up to be on their terms, what you might refer to as a controlled demolition. Following David Cameron’s rather odd dash to become a separatist the very next morning after the Scottish vote by inexplicably killing the Union by announcing “English votes for English laws” he fired the starting pistol for devolution right into his own foot. So where do we go from here and how do we escape the clutches of an establishment devolution model attempting to maintain as much of the status quo as possible with the illusion of more local powers? 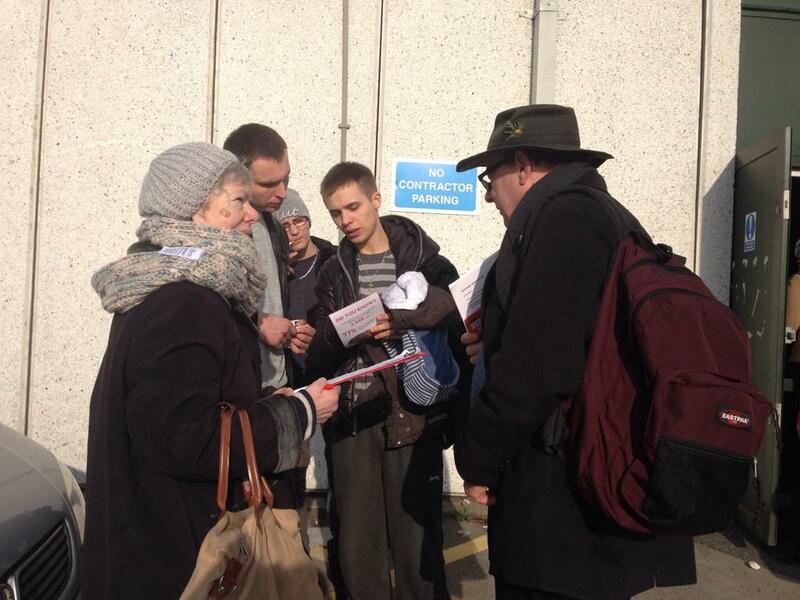 In Greater Manchester people have been organising since very early December. Folk from the broadest church of political affiliations gathered in central Manchester to establish The Greater Manchester Referendum Campaign to demand that the people of Greater Manchester have a say on whether they want a Mayor or not. An online petition has been set up but more importantly, “pile in” petition signings have been organised in all of Greater Manchester’s 10 boroughs since early January. 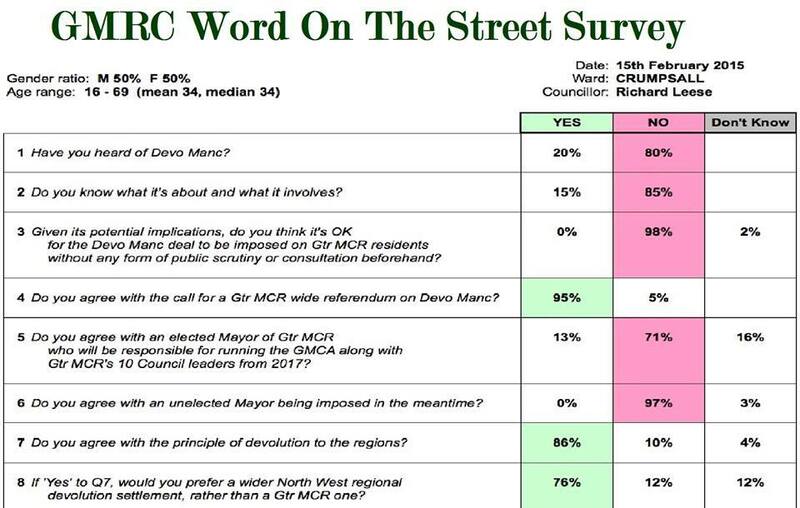 On Sunday 15th February GMRC members conducted a mass poll and survey of Sir Richard Leese’s Crumpsall constituency in North Manchester, Leese being one of the main architects of “Devo Manc” and the leader of Manchester City Council. It wasn’t surprising that the vast majority of Crumpsall citizens had no idea that “Devo Manc” was happening let alone the fact that they are soon to have a Mayor enforced upon them but perhaps what was surprising and somewhat heartening was that in answer to the question, “would you prefer a wider devolution incorporating the North West” the answer was an almost 80% YES. Probably the most interesting development in this fast moving story is the arrangement of “Assemblies for Democracy” with one being held in Manchester Friends Meeting House 18th April. 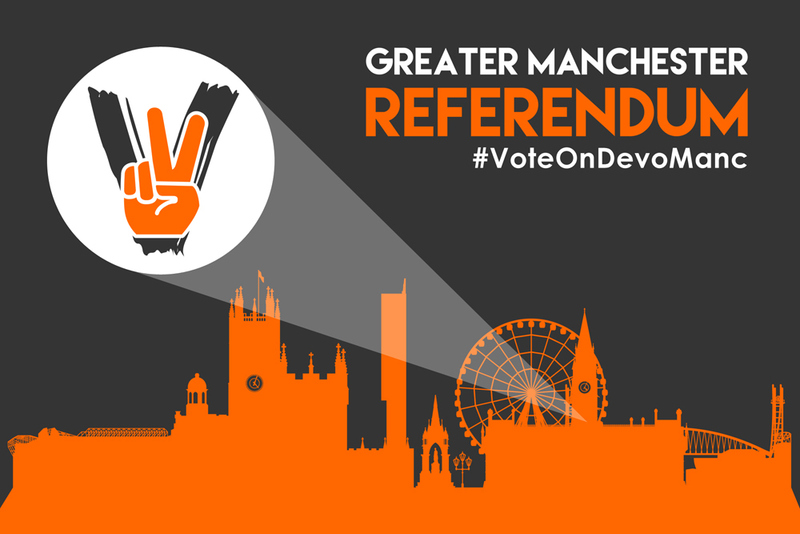 Momentum is fast growing for not only a rejection of “Devo Manc” but the securing of devolution on the peoples terms rather than the establishments. Another extremely interesting twist to this story are the contacts that are being made between North West advocates of a people lead devolution and Scottish independence groups and other devolution/independence groups from around the UK such as Yorkshire, Wales and Cornwall. It is also interesting that the drive for regional devolution is becoming a common purpose at a variety of levels within society with groups as diverse as Campaign for the North, the CBI and grassroots organisations all pulling in a similar direction and when you combine this with the burgeoning independent media scene and citizen use of social media the future looks intriguing. It is noteworthy that Paul Salveson is calling for a Northern Assembly fed by assemblies from across the region which is no doubt urgently needed. Perhaps the bigger question is, should there not be a call for a UK wide peoples assembly to settle this matter on a national basis and attempt to forge a new way for us all to live together on these islands? Doesn’t it just happen to be the 800th anniversary of the signing of the Magna Carta this June? I for one wish you the best of luck. Scotland has known for years that we all are at the whim of a pampered elite. They have destroyed our(UK) industries and brought poverty in from the victorian age whilst they grow rich and the poor and disabled are left in destitute. This once proud country has foodbanks everywhere. Foodbanks. Says it all. I spent many years in our forces based in England. have not got ONE single regret from those days and have friends for life. Good people. Politically Scotland is in another place. The union does not suit any of us now. Or England for that matter. They can tell us we lost the referendum but in truth it was only delayed. Time to create new partnerships with Independent states. London drains everything. Thanks for the read M. Nice to see the word getting out and folk taking an interest in politics . it effects us all and information and facts can break the endless cycle of spin and lies. Go England. Take your country back. We’ve had a wee start. And it surprised many how quickly folk were ditching the pub and football to go to meetings all over the place. It’s where i had the chance to speak and listen. Young and old alike we all had a voice. each had a view that was different but the aim was the same. It was a strange experience to start with but now it’s normal. The media paint a picture of division but that’s so wrong. We rarely discussed politics before unless in the right company , now even at the bus stop folk, often strangers to each other. talk and spread ideas and info. Anyone could have a say. Inclusive . not buts or ifs. And the atmosphere was fantastic. We all feel deep down we are doing the best for our country and now we had a “Loud voice”. It was a disappointment when we lost but these things happen i time. Did the sufferagettes give up. Human rights activists never give up. And if it’s for your country’s right to choose it’s own politicians and way of life then it’s personal and it’s for our kids and grand kids. You never stop. The world has changed. Don’t believe the drivel it’s an anti – English stance because it was never about England. It was to improve and build our own country. And any Englishman/woman know that they would never be happy with another country making decisions for them. And i lived with you guys long enough to know thats the case. It’s nice to see things heating up over the border. You deserve much more. Here here M. We have all suffered with this govt set up since Blair. We deserve so much more. We built an empire why not a new UK ? Many Scots wondered when our English cousins would waken up to the lies and spin. Your pages give us hope for all. Time the people of our countries had a proper say. You have support up here M. And examples aplenty to get folk involved. i wish you the best of luck. I have no doubts when you lot get started there will be no stopping you. 🙂 GO England. Claim your country back. Aye, and I thought it really important that Scots know that you’re not alone in your struggle for freedom especially as Project Fear Redux will be desperately trying to set us all against each other.